So, the Championship is all over and Charlton finished in a creditable 12th place. The fact that we were the first team to qualify for next season’s Championship competition tells a story in itself: Not good enough to go up (or even make the play-offs) not bad enough to go down (although at one stage it looked as if we might be). If you just considered the mid-table finish and the extremely high number of draws this season you might be forgiven for thinking that the season one of consistent mediocrity, but it wasn’t really like that. It’s been a bumpy ride with two main peaks and two main troughs. The first peak came at the start of the season with wins against Wigan, Derby, Norwich and Watford and an unbeaten run that lasted until mid-October. Gradually things started to turn sour though as wins turned to draws and draws turned to defeats. Other teams all seemed to have worked out how to stop us and if management had an alternative plan, the players never put it into effect. 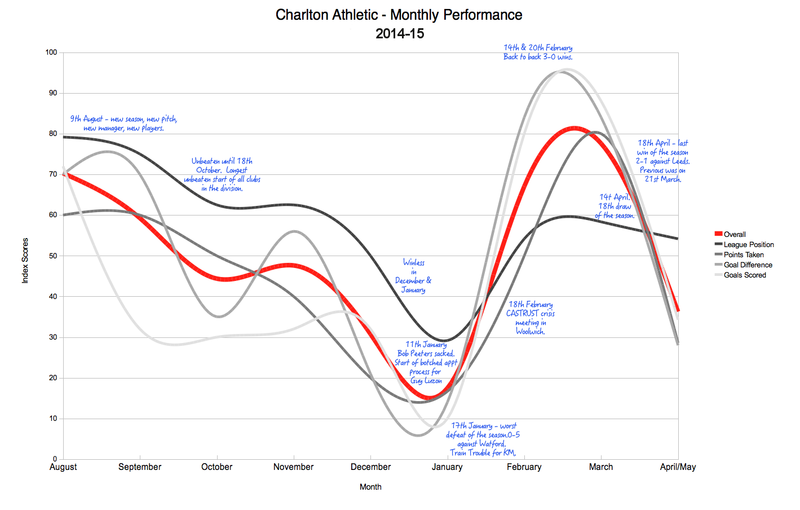 A three month winless streak from mid-November to mid-February saw Charlton drop as low as 20th in the table. Manager Bob Peeters seemed to have ‘lost the dressing room’ whist the club seemed in danger of losing its fans. In a few short days in mid-January Peeters was sacked, Luzon was appointed and Meire was accused of lying. This was the nadir of the season. Guy Luzon did well to keep his head when all about were losing theirs and changed the team into a more attacking force that put together a string of wins in late February and March, scoring three goals on five occasions. 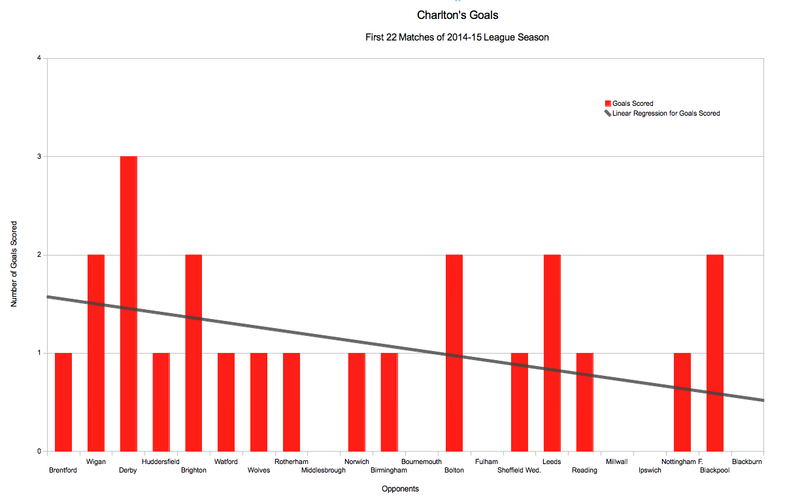 This period saw safety guaranteed as Charlton moved into the top half of the league table. Sadly it wasn’t to last. Once a certain level had been reached, the wins dried up as the players went on their proverbial summer holidays. The last month was one largely filled with frustration, ameliorated only be the demise of our leonine neighbours and win’s for the U18s in their league and the U21s in the Kent Senior Cup. The bumps and dips of the season are shown on the chart below, which uses an index rating to show the changes in fortune of the club for it’s league position, points taken, goal difference and goals scored. In 1958 the club failed in their bid to get re-promoted. Defeat to Blackburn Rovers on the last day of the season kept them in the Second Division where they would stay for the next 15 seasons. 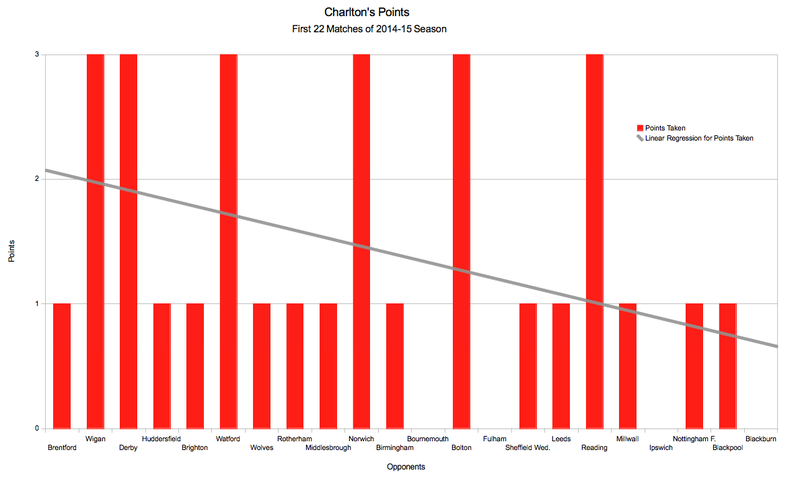 Years without any significant development and a pattern of selling-off the best players finally saw Charlton leave the Second Division in 1973 when they dropped down into the Third.